Cheim & Read is pleased to announce an exhibition of new work by Pat Steir. 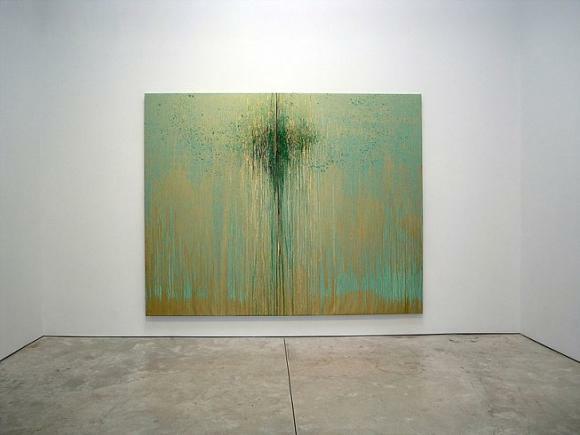 Pat Steir had her first one-person exhibition at the Terry Dintenfass Gallery in New York in 1964 and has been showing nationally and internationally since that time including participation in several Whitney Biennials and Venice Biennales. She represented the U.S. in the 19th Sao Paolo Bienal and was also included in Documenta IX. "I'm (trying to make a picture of) something that wasn't there before, an impression of existing phenomena. I've always liked being an oil painter, attaching myself to the mythology and the magic of making something that relates to history, that has a history, an image of space that is simultaneously flat and deep. Making a line. If I were to draw you and draw your hair, I'd have to make a curvy line. The idea that that curvy line can then represent hair is breathtaking. I think, "oh, that's the most conceptual thing I ever saw in my whole life. The most abstract concept." … "that a line can represent something more than a line."